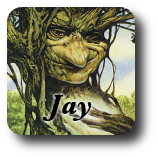 1/28/2014 - I mocked Forest Giant up about a year ago. 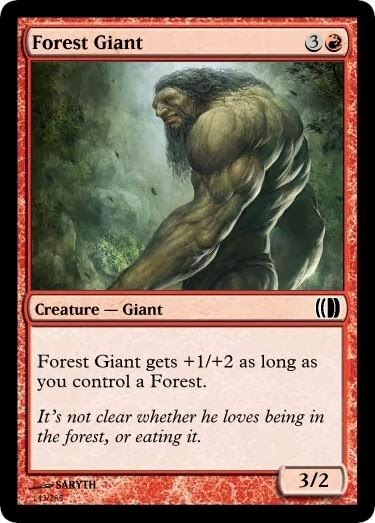 IIRC, it came about when we were discussing giants that wield trees as clubs, but I love that it's a reasonable card to play in Limited both with and without forests. Not nearly as strong as Kird Ape, but strong enough (again, for Limited). Yeah, that would capture the flavor well. I'm a bit surprised nothing like that was printed in Lorwyn, actually. He's got two arms… why not twice per turn? This feels like it will play as Rhox Brute 99% of the time, cause I couldn't see running this in a deck that didn't have green. A vanilla 3/2 for 4 is a bit below the curve. To be more specific: why is Kird Ape interesting? Because you play it on turn 1 and your opponent literally doesn't know if it's going to be a threat on turn 2 or not. With Forest Giant, if you are running red/green and you have 4 mountains and no forests out, things are going very badly for you and a 3/2 ground thing is probably not what you need. I don't think the suspense of whether Kird Ape will deal 1 damage or 2 on turn two is what makes it interesting. Getting an undercosted creature by loosely committing to two colors—and the fact that unlike gold you don't need that second color to cast the creature—is what's interesting about it, to me. Forest Giant does the same thing, just not at Modern- or Legacy-playable level. Why not 3/3 and +1/+1? I think the precedent set by Arabian Nights has died of old age. 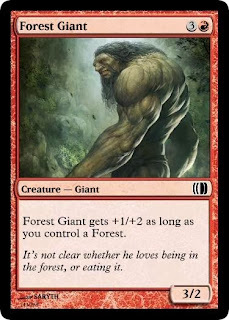 If you're doing just Forest Giant, I'm thinking it's better to match the classic precedent despite new technology. If you're doing a cycle or more, it's probably worth it to break that mold and go with the simpler bonus. That has the added benefit of making the ability all-upside (instead of just mostly-upside). I love the flavor that naturally makes this card make sense. Perhaps numbers could be tweaked to meet Limited demands, but keep this design. I'm not sure what Limited demands the current numbers don't meet.